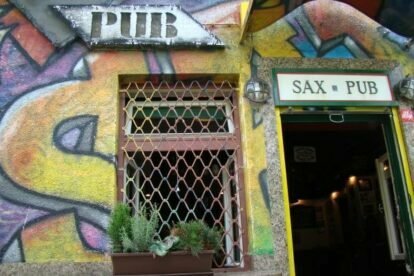 Sax pub is located on Eipprova Street. It was the first pub in the street. After that, a lot of other cafes and restaurants opened their doors but despite those you can’t really miss Sax pub. It’s a small house covered with graffiti. You could call it the second jazz club in Ljubljana as it has a stage smaller than a normal toilet. It’s well known for its great atmosphere, especially during the summer, when they have concerts on a stage near Gradascica River, which was made by Slovenian architect Joze Plecnik. The place is perfect for a break from the center if you don’t have enough time to go somewhere further away. You will find Eipprova Street south of the center in the city part called Trnovo. It is also possible to walk there from Preseren’s square, if you just walk along Ljubljanica River.